No, I haven’t lost my mind and I am not cooking with shoe heels! We are making bourbon salt this week. Some of you in the bourbon community know “heel parties” having attended or hosted one - you bring some of your bottles that have just a “heel” remaining and if you luck out, sometimes you have an opportunity to try a bourbon you have never had before. Orrr...you can make this super easy, super useful bourbon salt with some of your bourbon heels. Bourbon salt makes a great addition to your spice rack or your home bar. I planted some herbs this summer and wanted to infuse some salt with them and came across a wine salt recipe. Intrigued, it made me think of the bourbon salts I’ve seen in distillery and specialty shops in the Kentucky area and well, one thing led to another and I started boiling some bourbon! Bourbon salt is a handy multitasker and I love making things that have different uses. If you look back and make the Dark Chocolate Bourbon brownies we posted a few weeks ago, you could sprinkle a little bourbon salt over them for dark chocolate sea salt combo that is all the rage. You can also keep this salt on your bar for cocktails that require a salted rim (think Caesers and Margaritas – it’s a sneaky way of slipping some bourbon into that non-bourbon drinker’s cocktail- shhh…that’ll be our secret). I like to use it to on steaks that just come off the bbq – so good. Or use it as a base for a dry rub on some killer ribs as I did. It’ll also come in handy for another Whiskey Corner post over the coming weeks. If you think sweet and salty, I’m sure a few ideas will ‘pop’ into your head 😉. For this recipe, I have mixed different bourbons. Much like a seasoned salt combines several different flavors, using a few different bourbons will provide some unique tasting notes in the salt. Every batch is a whole new ballgame – but maybe keep track of what you are using in case you hit a combination that is amazing – just don’t forget to share it with us! Bring the 2 cups of bourbon to a boil and reduce by half, this takes about 10 minutes but keep an eye on it. Turn the heat down to a simmer and further reduce until a thick syrup remains – this will be about an ounce of liquid. It takes another 25 min to get there but it does happen quickly as you near the finish line and can burn easily, so don’t wander off and get distracted. Remove from heat and add the salt and sugar, stirring until combined. It will resemble sand. Yum. On a parchment line cookie sheet, spread the salt evenly to allow it to dry using either the air dry method or the oven method. While your bourbon salt is drying, pour yourself that extra bourbon and make a list of all the things you will try this bourbon salt on. You may even want to be generous and give some as a gift. Lucky friends! Once dried and cooled completely (if you used the quicker oven method), store in an airtight container indefinitely! If you like to share your homemade bounty or gift them, make a double batch, place in a small glass jars, add a funky label and make someone happy. 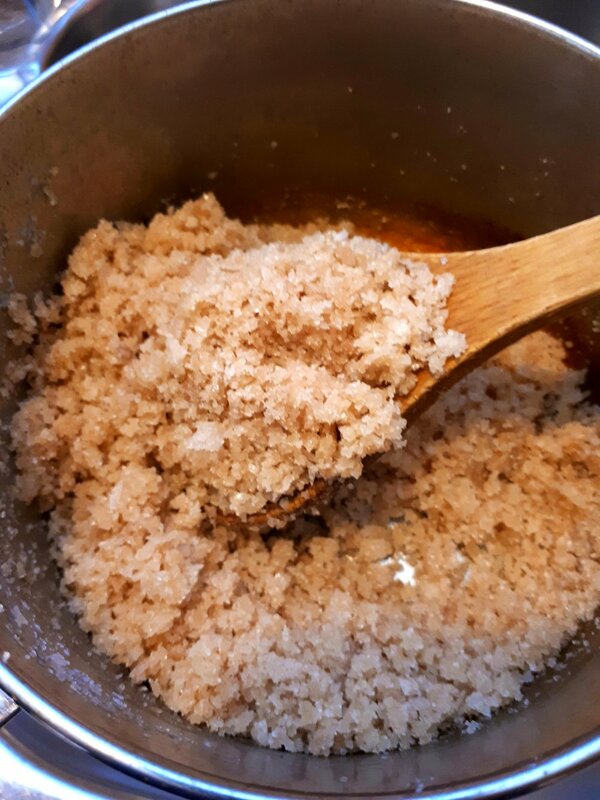 Everyone appreciates an indulgent homemade gift and now that you can make your very own bourbon salt at home, you will discover its multiple uses and know that once again, it was made by you! How cool is that?